Happy Wednesday! And Wednesdays bring new challenges at Freshly Made Sketches each week. This go around, I get the pleasure of being the hostess and I have a pretty simple and clean sketch for you to try. Since the sketch is pretty simple, I wanted to keep my card clean and simple. 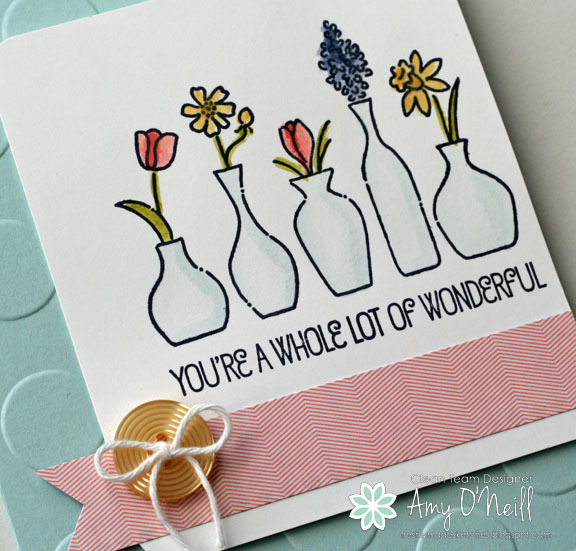 I pulled out my Vivid Vases stamp and watercolored it with an aquapainter. 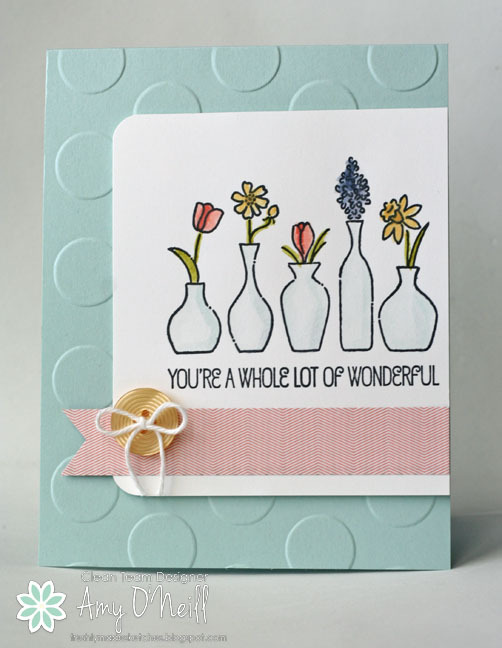 I used a card base of Soft Sky card stock which was embossed with the Polka Dot embossing folder. I used a little strip of dsp from the Stacked with Love stack, and added a button. I rounded two of the corners, and made myself stop. We hope you’ll join us and create your own card. We’d love to see what you do with the sketch. Meanwhile, you can go by the Freshly Made Sketches site and see what the design team made for some inspiration. You won’t be disappointed. This entry was posted in Freshly Made Sketches Challenge, Vivid Vases. Bookmark the permalink. Sweet as can be! Love all the soft colors…..and you are a pro with that aqua painter! Wonderful sketch too! Such a pretty little spring card! I’m in love with those flowers (smacks head that I don’t have them). Your coloring adds just the right touch. Thanks for such a great sketch this week! 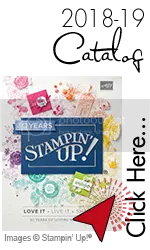 Love this and am so excited to see an example of what I can do with this stamp. Your vases are colored so beautifully. I love them against the embossed circles. Thanks for giving us a classic sketch! This is just lovely Amy! I love how you use colours and I love your image choices. Your sketch is as always fabulous! The embossed card base looks gorgeous behind this beautiful image! Great sketch and a great card! This card is a whole lot of wonderful! It’s so pretty Amy! I love those flowers in their vases! Such a great colouring job! 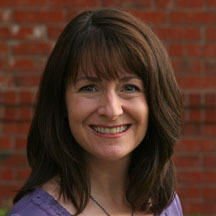 I love that embossed background! Beautiful!